The 21st GENI Engineering Conference (GEC), hosted by Jon-Paul Herron of the Indiana University Global Network Operations Center, was held from Monday October 20 through Thursday October 23 in Bloomington, IN. This GEC completed the transition to a new conference structure based on community feedback at GEC19. Day 1 of the conference was primarily for newcomers to GENI; Days 2 and 3 formed the core of the conference with sessions of interest to experimenters, campus operators and developers; and Day 4 was primarily for GENI developers. This new format was well received, especially by developers who appreciated having time for discussions on Day 4 without being pulled away but other concurrent sessions. Over 80 attendees participated in the Day 1 newcomer tutorials. About half of them used the new jFed graphical tool while the other half used the new Jacks tool. A new session on this day had attendees pick one or more assignments of interest to them and work on them without the aid of step-by-step instructions. The objective was to prepare them to work independently on their own experiments. Presentations and tutorial instructions for all the conference sessions are available on the GEC agenda page. 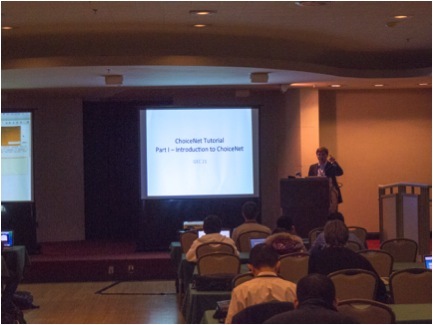 Tutorials by four NSF Future Internet Architecture (FIA) projects: A ChoiceNet tutorial led by Tilman Wolf (U. of Massachusetts) and James Griffieon (U. of Kentucky), MobilityFirst tutorial led by Ivan Seskar and Francesco Bronzino (Rutgers U. ), an NDN tutorial led by Alex Afanasyev (UCLA) and Steve DiBenedetto (Colorado State U. ), and an XIA tutorial led by Dan Barrett, Srinivasan Seshan, Matt Mukerjee and Yuchen Wu of CMU. All four of these tutorial were well attended. A series of tutorials on scripting and scaling up experiments. Divya Bhatt and Mike Zink did a tutorial on LabWiki, a tool for scripting experiments; Thierry Rakotoarivelo and Max Ott did a tutorial on OEDL used for scripting and orchestrating experiments; Nick Bastin did a tutorial on geni-lib, a Python library useful for parsing advertisement and manifest RSpecs and programmatically generating request RSpecs; and Sarah Edwards and Xuan Liu did a tutorial on systematically scaling up experiments. Tutorials on wireless experimentation using the Belgian iMinds w-iLab.t testbed with mobile robots by Pieter Becue, Brecht Vermeulen and Thijs Walcarius; using GENI WiMAX resources by Fraida Fund, Ivan Seskar and Abhimanyu Gosain; and installing 3rd party services on home WiFi routers by Suman Banerjee. An experimenter/developer roundtable session where a panel of experimenters from the Future Internet Architecture projects and a couple of other advanced GENI experimenters described their experiences using GENI. A separate panel of GENI developers responded to the experimenter feedback. There was a good discussion about improving the experimenter experience of building WAN topologies and the developers identified improvements they will implement and deploy. A GENI Operations session that covered a combination of topics on in-process and future planned operations and integration work. There was a lively discussion about the dearth of VLANs at some campus and regional endpoints and what can be done about it. Best Demo: Vehicular Sensing and Control by Hongwei Zhang, Yuehua Wang, Jing Hua, Chuan Li, Hai Jin, Yu Chen, Pengfei Ren, Ling Wang, Anthony Hold, Patrick Gossman and Xiaohui Liu of Wayne State University; Jayanthi Rao of Ford Motor Company; George Riley of Georgia Institute of Technology and Weidong Xiang of the University of Michigan-Dearborn. 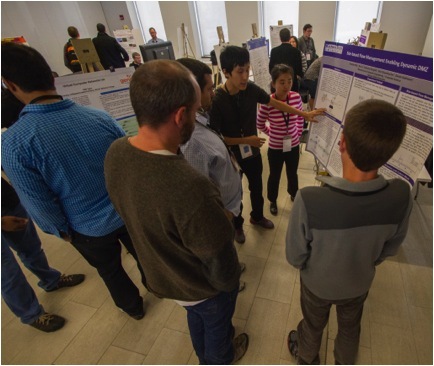 First Runner-up: GENI Cinema by Ryan Izard, Kuang-Ching Wang, Joseph Porter, Benton Kribbs and Qing Wang of Clemson University and Aditya Prakash and Parmesh Ramanathan of the University of Wisconsin-Madison. Second Runner-up: GENI Over the Air by Shengli Fu and Yixin Gu of the University of North Texas.